And then we were off to Melbourne to ring in the New Year. We’d been to Melbourne, capital of the state of Victoria, in 2004 and remembered it as one of the great cities of the world. We were not disappointed by our return. 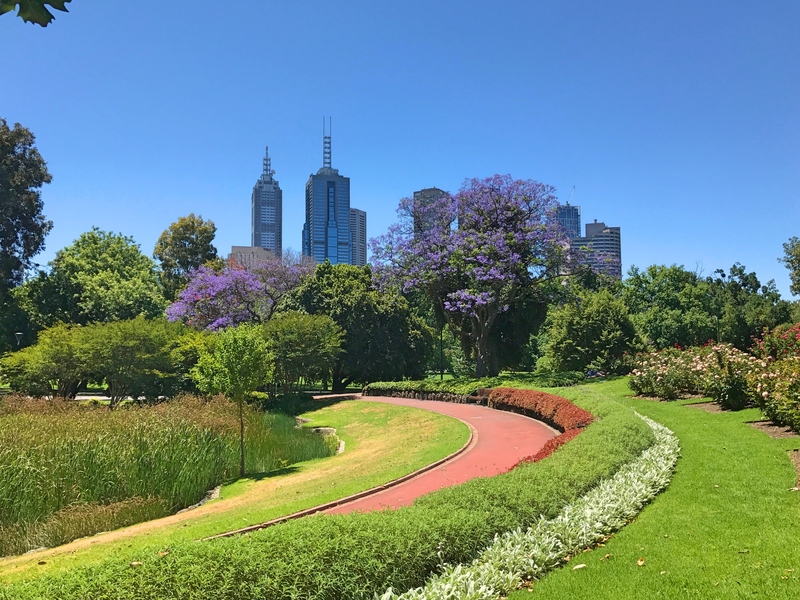 Melbourne is Australia’s second city, smaller than Sydney, younger than Sydney, without the stunning natural beauty of Sydney’s harbor or the iconic Australian images of Sydney’s Opera House or Bridge. So Melbourne has to try harder. And it succeeds. Great architecture. Vibrant streets and street art. Wonderful food. Amazing museums. Beautiful parks. We loved Melbourne 12 years ago and we loved it again. And on top of that, we had friends to visit. 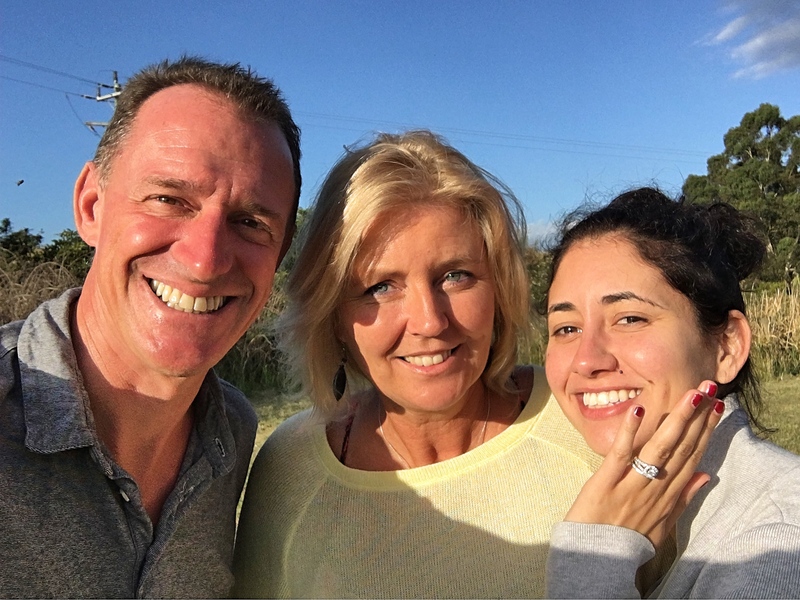 We met Mandi & Jean Philippe on our boat cruise in Fiji and, although they were on it for just three days, we really hit it off with them. When they saw on Facebook that we were in Australia they insisted that we let them know when we made it to Melbourne. 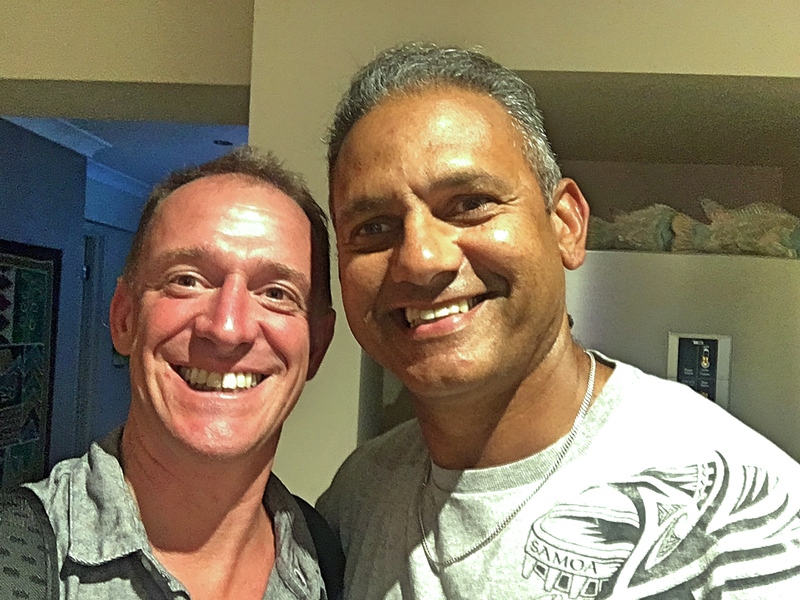 And so on December 30 we caught a commuter train out to Narre Warren, a suburban community about 25 miles southeast of Melbourne for a traditional Mauritian upside-down dinner (Philippe is originally from Mauritius). We got to meet their two kids and spouses who were around for the holidays. And for a big bonus they’d promised us kangaroos, so before dinner they drove us out to an area where he runs and sure enough we saw dozens of kangaroos in the wild, just out hopping around. Pretty cool. There’s nothing particularly interesting about this painting in the National Gallery of Victoria. 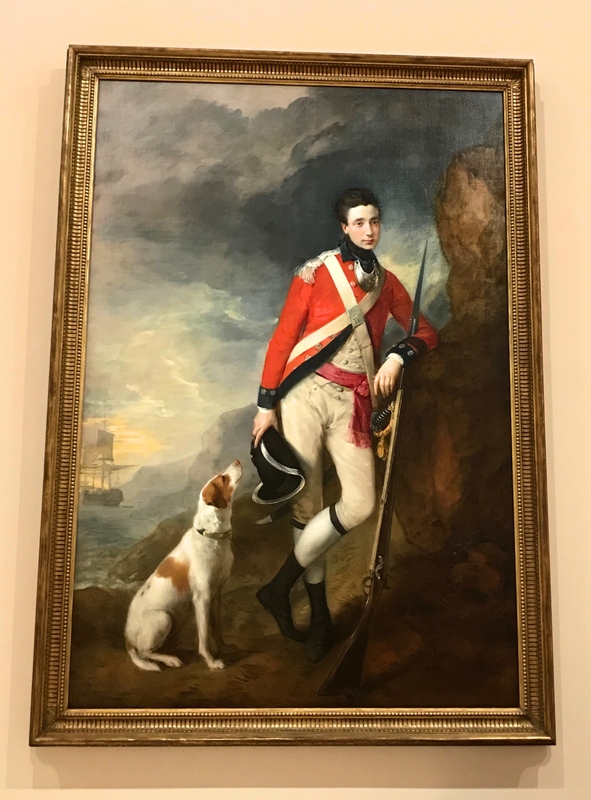 But when I saw that it was a portrait of a guy named Richard St. George Mansergh-St. George, how could I leave him out? I learned that he fought in our Revolutionary War (though on the wrong side, of course) where he left part of his skull after being shot in the head. 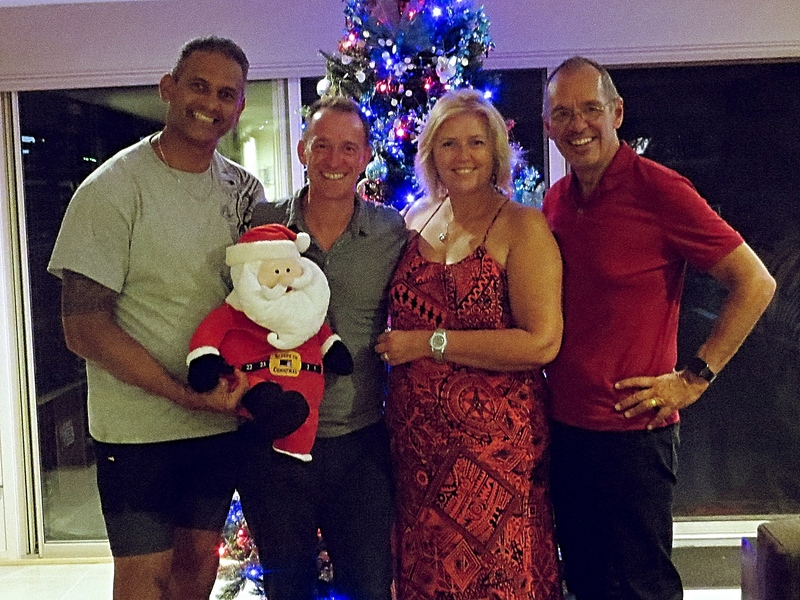 And speaking of friends, another couple that we’d met in Fiji, Charlotte and Piers, were passing through Melbourne at the same time so we had drinks with them, as well. 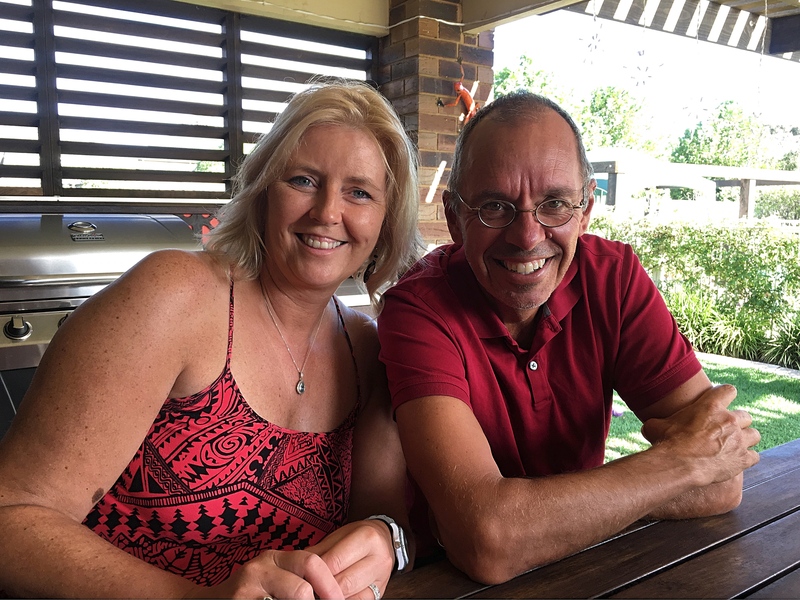 When last seen Charlotte & Piers were in Surfers Paradise on their motorized excursion around most of the perimeter of Australia. Melbourne was their last stop before flying on to the Philippines, so we got to say goodbye to them over drinks on New Year’s Day. They’re starting to wind down their around-the-world trip, getting ready to head back to the world of apartments and jobs, but they’re such a fun and interesting couple I’m confident we’re going to find ways to meet up again soon enough. The other thing we’ll remember about Melbourne is the amazing National Gallery of Victoria. I stopped in there when, on our first afternoon in Melbourne, I was headed to the park to read when it started raining. “Might as well duck in here,” I thought, and thus was lost for two hours in a remarkable collection of art spanning centuries and continents. I loved the way it was laid out and the combination of Australian artists mixed in with great European masters. And I loved the fact that the permanent collection is free, always my favorite price point. Mark went on his own a couple days later, mostly to see a special David Hockney exhibit which he later described as one of the greatest exhibits he’d ever seen. 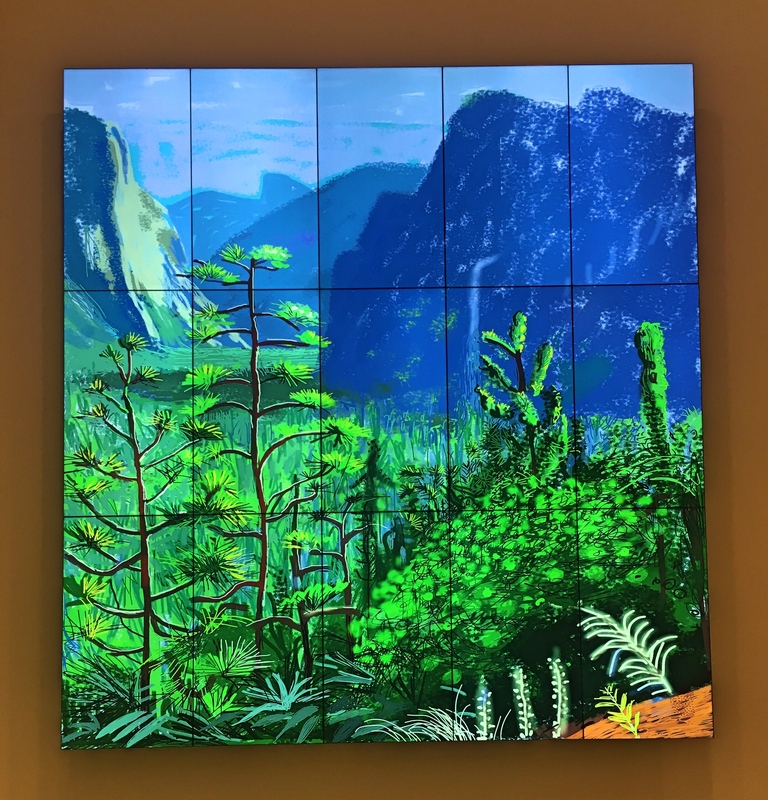 It’s an exhibit of some 1,200 pieces just from the last decade, many of them created on Hockney’s iPad or iPhone. 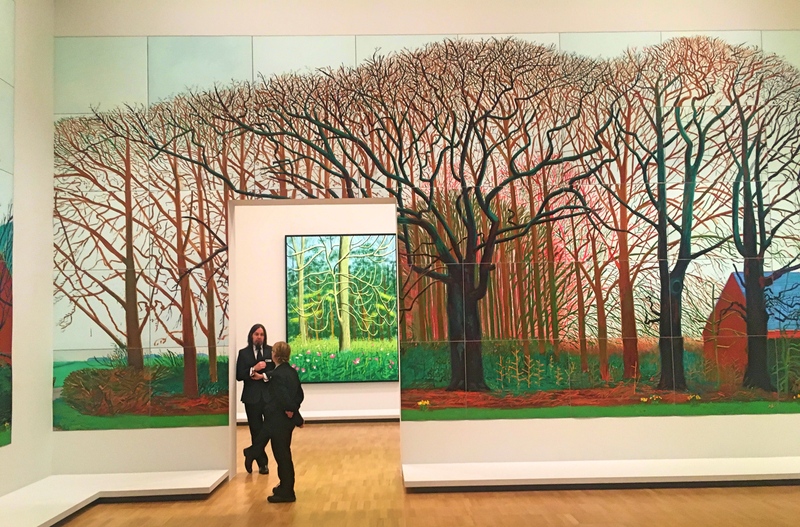 The exhibit was curated by the National Gallery of Victoria along with Hockney, so on top of it all it is a remarkable tribute to the NGV itself. I’d been reluctant to spend the time and the $20 or so they were charging but as I look at the pictures Mark took I obviously made a stupid decision. And finally, the food. Early on we discovered a great bar/restaurant called Meatballs and Wine where, not surprisingly, they serve meatballs and wine. The owner is an Italian who loves meatballs and wine and found a way to transplant a bit of Italy to Melbourne. So after first trying them for lunch, that’s where we had our New Year’s Eve dinner before heading back to our hotel in the center of the city to watch the fireworks with a few thousand of our closest friends. Fun! 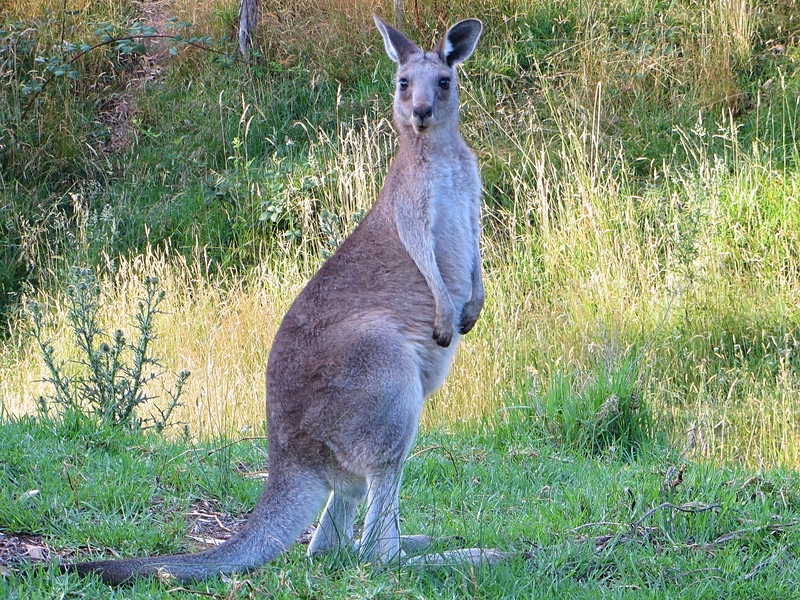 Finally, after weeks in Australia, we saw kangaroos in the wild. Very cool. 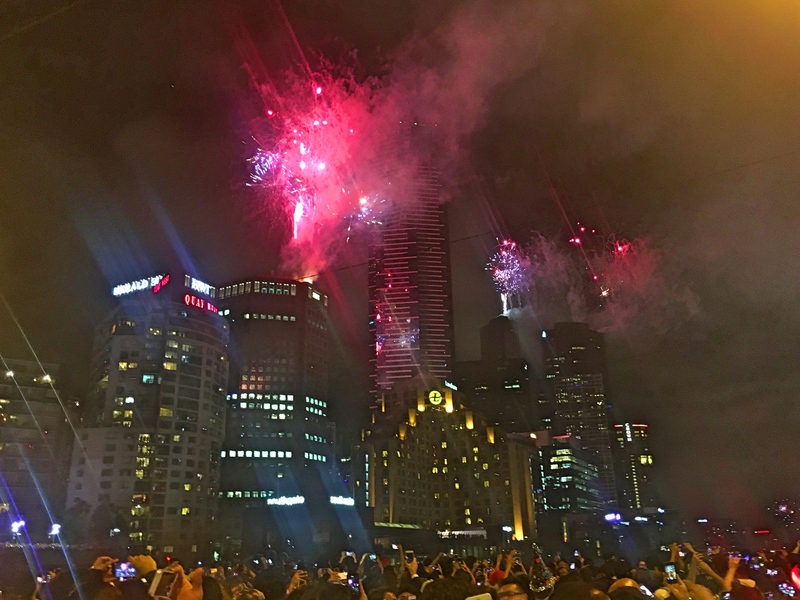 We inserted ourselves into a massive crowd just before the fireworks went off on New Year’s Eve. It was as though they were shooting out from the tops of the skyscrapers. 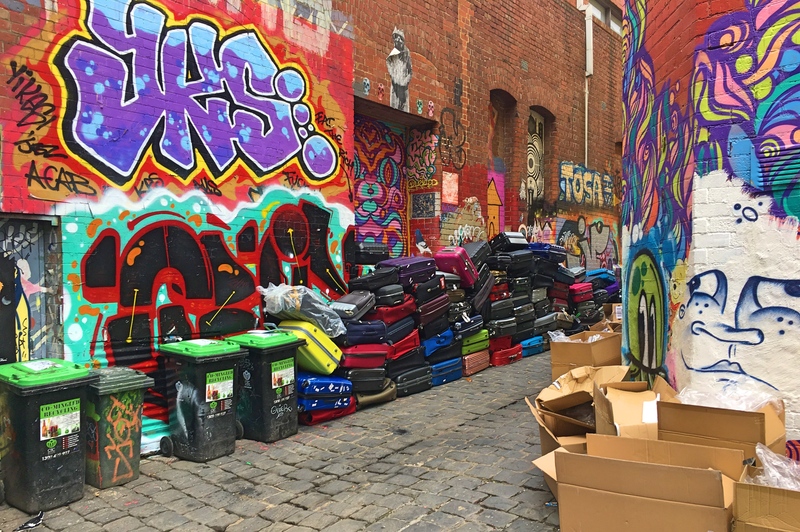 Melbourne is famous for its colorful lanes, alleys with great street art. Here the art is combined with … suitcases. 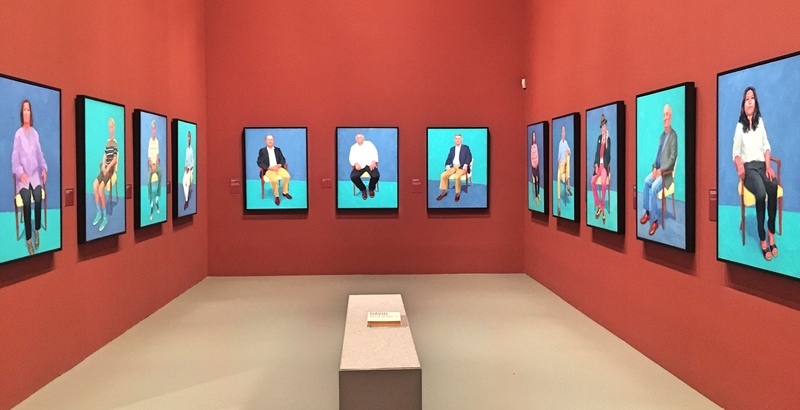 This is a small portion of one piece of the Hockney exhibit titled 82 Portraits and 1 still life, all people Hockney knows, done in separate three-day periods between 2013 and 2016. Impressive output for someone well into his 70s. A picture with a story. The museum bought this in 1940 thinking it was a Van Gogh, the first and, until 1990, the only Van Gogh available to the public in Australia. In 2007, though, the Van Gogh Museum in Amsterdam determined that it was not in fact a Van Gogh, that it was merely by some unknown contemporary. Alas. Further research, though, determined that the painting had belonged to a Jewish collector in Berlin who had been forced to sell it to the Nazis. 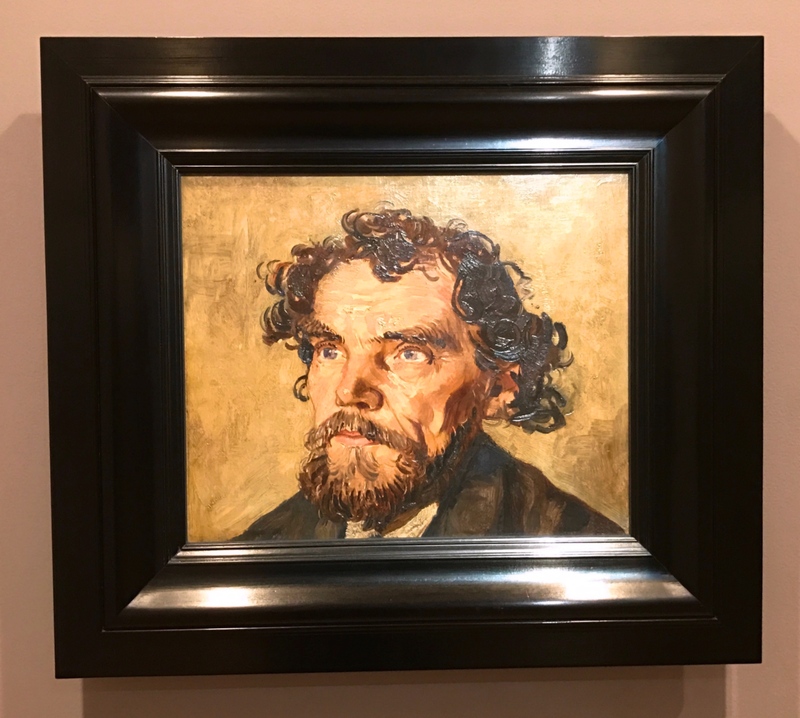 The museum agreed to return it to the original owners heirs – a cynic would observe that it wasn’t after all a real Van Gogh – who then loaned it back to the museum (since it is not, in fact, a real Van Gogh). 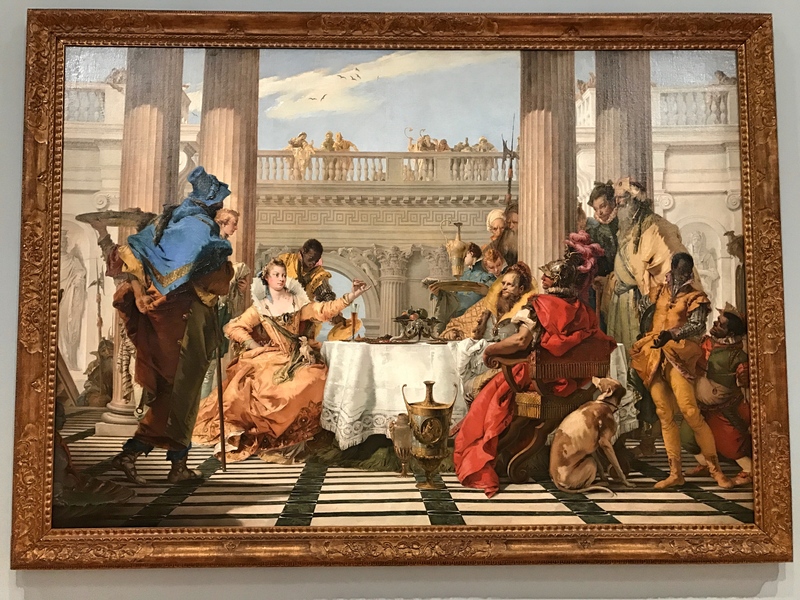 This 18th century “Banquet of Cleopatra” is one of my favorite stories from antiquity. The Egyptian ruler Cleopatra has heard of the legendary feasts sponsored by the Roman Mark Antony and bets that she can outdo him. At the end of a sumptuous meal she then takes off a huge pearl earring, dissolves it in vinegar and drinks it. Now that’s extravagant. She won the bet and with it Mark Antony’s heart. Until they lost their war for Roman supremacy – and their lives – to one Octavius, known to history as Caesar Augustus. 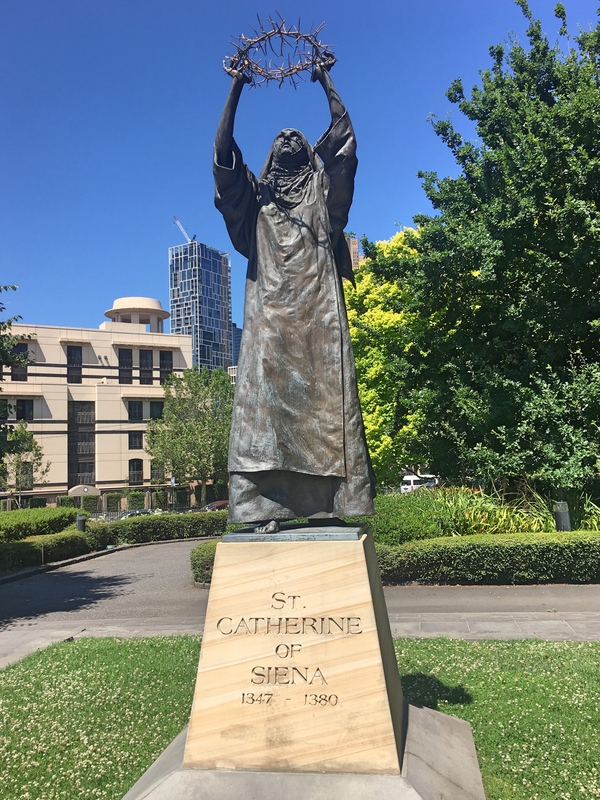 And finally, I don’t know why, but Melbourne has a status of St. Catherine of Siena. What’s cool about this is that we saw her head in a church in Siena an the rest of her body in Rome. Just a fun little memory.